This exercise pack allows students to practice dividing multisyllable words that are closed syllable types and mixed open and closed syllable types. 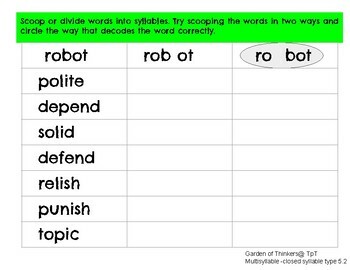 It forces students to look at multisyllable words and to be flexible when decoding them. They have to decide which way of dividing will help them to decode the word correctly. There are 8 pages of words to split. 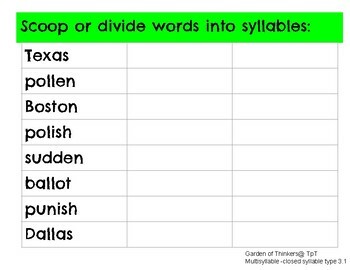 4 pages are closed multisyllabic words and 4 pages are mixed with open and closed multisyllabic words.